"Our people and our society chose to unite, connect, and escape the split," says Blue and White chairman. 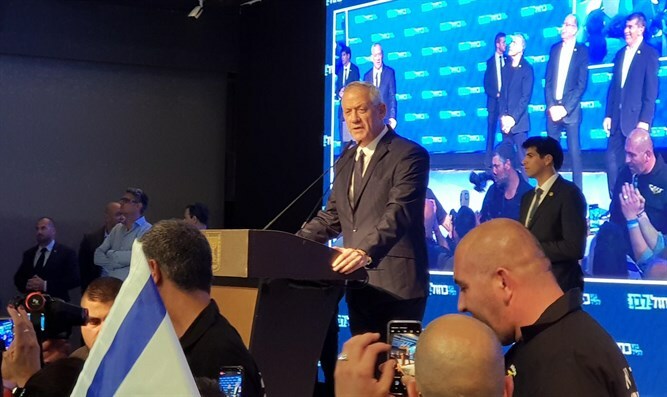 Blue and White party chairman Benny Gantz spoke to his activists at party headquarters on Tuesday night and thanked them. Gantz began his remarks with the Birkat Kohanim (priestly blessing). "This is a historic day. A great light shines upon us, more than a million people voted for Blue and White. Our people and our society chose to unite, connect, and escape the split. I would like to thank Yair [Lapid], Bogie [Ya’alon] and Gabi [Ashkenazi] for a common path and willingness to work together. The whole is greater than the sum of its parts. We won and we will continue to win,” he declared. "We will respect the will of the voter. As Netanyahu said, the largest party is the one that should receive the mandate from the president [to head the government]. In the elections there are losers and winners - and we are the winners," added Gantz. "We're going to connect everyone, see how we connect and not how we fight. I will be the prime minister of everyone, and not only of those who voted for us," he promised. "We may be new but we are not naïve. We will wait for the real results that will develop in our favor. We will all stop, we will bow our heads, and remember the victims that fell along the way, and remember that we have missing people that we are obligated to bring home. We will remember that there are families who continue to bear the price of living in the State of Israel." A Channel 13 News exit poll found that the Likud and Blue and White parties each win 36 Knesset seats. However, the right-wing bloc, according to this exit poll, stands at 66 seats, while the center-left bloc has 54 seats.